Toyota is planning to offer more powerful hybrid options across its core model line-up. 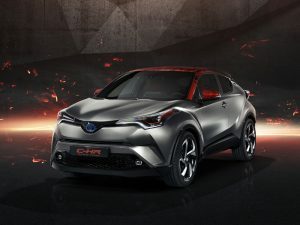 At the Frankfurt Motor Show, the carmaker revealed its Toyota C-HR Hy-Power concept previewing the possibility of a higher-powered hybrid system for its 1.8-litre petrol-electric hybrid coupe-crossover, although actual figures and timelines were not announced. Introducing the concept, Dr Johan Van Zyl, president and CEO, Toyota Motor Europe, said customer feedback had highlighted an opportunity to introduce a higher-performance hybrid powertrain, alongside the 1.8-litre unit also seen in the Prius. The move would see the current set-up become focused on efficiency and fuel economy, with a new offering building on this with more power and dynamic driving, with further details to be announced next year. Dr Van Zyl added: “Hybrid will remain our key differentiator. We will expand our (hybrid) offer with more derivatives. And we will take care of our customers with an ever stronger focus on our “customer-first” approach. Toyota also emphasised that its hybrid architecture – also used to serve the basis for its Prius plug-in hybrid and Mirai hydrogen fuel cell car – will continue to form the “backbone” of its powertrain programme, forecast to help cut its vehicle carbon emissions by 90% by 2050, compared to 2010. Toyota’s stand at Frankfurt also uncovered the facelifted Land Cruiser, which brings updated design and new safety and infotainment technology.